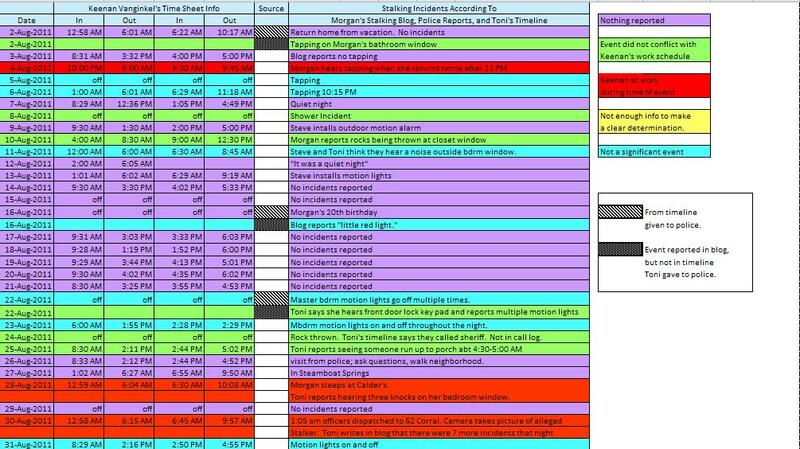 Yesterday, May 20,2013, Toni Ingram tweeted 14 “clues” that she apparently thought were significant in relation to her daughter’s death. By definition a clue is something that serves as a guide or aid in the solution of a problem or mystery. Following that definition, these aren’t really clues. None of these lead anywhere. Below are Toni’s clues followed by my response. Clue #2 How could a person have a blood level of 7900+ng in her blood, when 1,000 ng is lethal? Clue #5 The Pathologist that did Morgan’s autopsy blames PMR for her high reading, but PMR kicks in at 24 hrs & goes for the next 24 hrs. I have grouped these first six together since they all concern amitriptyline. This has all been addressed before, much of it in a previous blog, What Dr. Kurtzman Knew. Either she does not understand the science or she refuses to accept it. Toni claims they have consulted with several medical professionals but I find that claim highly suspect. These first six “clues” show a complete lack of understanding for even basic pharmacology and organic chemistry. Toxicity and absorption of drugs cannot be discussed without a basic understanding of pharmacogenetics. Pharmacogenetics is the study of genetic differences that affect an individual’s response to certain drugs. Different drugs undergo different metabolisms as a result of genetic variation, especially in the cytochrome p450 family of enzymes. My point? There are no absolutes. It’s impossible to know Morgan’s cardiotoxic level without knowing if she was or was not deficient in the cytochrome P450 enzyme. Cardiotoxic levels of amitriptyline generally occur between 450 ng/ml to 1,000 ng/ml. Okay, so how did Morgan end up with a postmortem level of 7909 ng/ml. First it is essential to understand that when medical professionals talk about the cardiotoxic level they mean antemortem, prior to death. Antemortem levels are based on plasma, which is prepared by spinning down a fresh whole blood sample to remove the red blood cells, white blood cells, and platelets. From a pharmacokinetic perspective, red blood cells, white blood cells, and platelets are a tissue compartment. As I mentioned in What Dr. Kurtzman Knew, amitriptyline is highly lipophilic (lipo=fat + philic=love of) and found in greater concentrations in both fat and protein than in plasma. The human body begins autolysis, the breakdown of tissue, at the moment of death (the idea that this process waits 24 hours and ends 24 hours later, is laughable). Amitriptyline, resides mostly in deep tissue compartments and is released into whole blood. The result is the levels in the whole blood, which is what is used for a postmortem sample, will reflect concentrations from tissue, red blood cells, white blood cells, and plasma and range from 5 to 10 times higher than the antemortem plasma concentration. In addition, there may be redistribution from other tissue compartments into the blood as the body decomposes. Clue #6 [sic] Morgan had an overkill dose of drugs in her blood, but no container or syringe was found anywhere in her room or in the house. The “container” was the pill bottle next to her bed. Clue #7 Morgan’s nails were torn on her right hand 1-1/2 years later nobody in GarCo can produce a picture from the crime scene of her nails. According to the medical examiner, her nails were intact when Morgan left his morgue. Once the Coroner arrived on scene the towel covering Morgan’s upper portion of her body was removed. Video and photographs of Morgan’s body were taken at this time. I did not observe any signs of trauma on Morgan at this time. Clue #8 ALL of her jewelry of value went missing on the night she was killed while her #stalker frequents cash for gold establishments. Toni concluded Morgan’s jewelry was missing only after she heard Keenan was picked up on a theft warrant. These charges were later dropped. I explained to Toni that if she wants to report a theft of Morgan’s jewelry I would be happy to assist with that and either generate a new case or add it to the ongoing stalking case. I then told her that she would have to complete a list of stolen items and that she could not look at a list of items and determine what had been stolen from that list. It should be noted that there is no information to believe that Keenan Vanginkel has stolen any of Morgan Ingram’s jewelry. Furthermore, Toni or Steve Ingram have yet to provide me with a list to base a theft report on. Clue #9 Morgan’s #panic button was torn from its mount on her nightstand and found hidden in her room. We only have Toni’s word on this and we all know what that’s worth. Clue #10 The rain gutter directly over Morgan’s bedroom window was torn in half by repeated bending by her #stalker leaning over the edge! During this time I observed that Morgan’s bedroom was disorganized with clothing and other items covering the majority of the floor. I observed that the adjoining bathroom to Morgan’s bedroom was in the same condition. Did the struggle continue into the bathroom? If Morgan fought off an attacker to the point that it left her room in disarray (Det. Sergeant Breier called it slovenly), how is it she bore no defensive wounds and her body showed no signs of trauma? How is it this struggle was not heard by Steve and Toni Ingram? 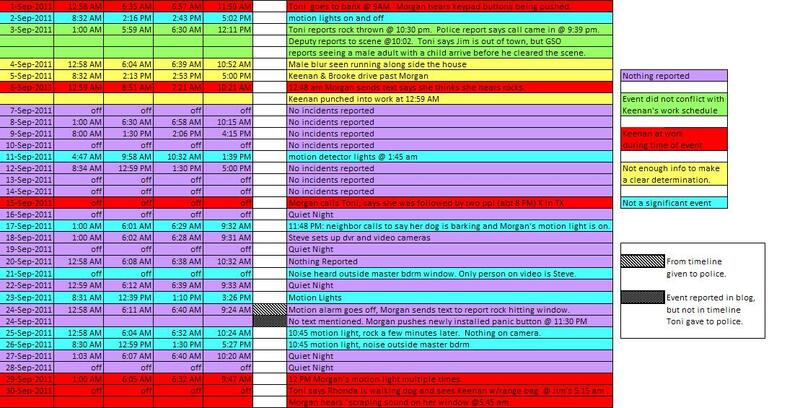 Clue #12 Figures are caught three times outside the house by video surveillance on the night Morgan was killed. How did the neighbor know what happened in Morgan’s bathroom? Surely Morgan would have her blinds drawn/shade pulled down etc. Clue #14 Why would a person that does not know Morgan or her family & wasn’t involved in her stalking/murder be so invested in lying? First: I have never lied about Steve, Toni, or Morgan Ingram, Keenan, Brooke, or anyone else connected to this tragedy. 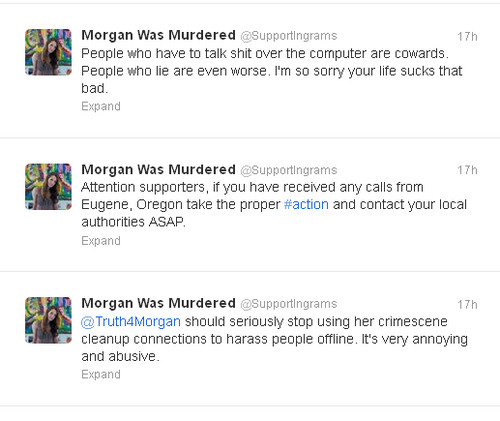 The Truth for Morgan group has NEVER harassed or bullied Steve or Toni Ingram or any of their supporters. We don’t have to slander Jodin Davunt, Sarah Afshar, or Mark Mann et al. They have successfully made themselves look far worse than we ever could. When I discovered distortions and outright lies in the Morgan’s Stalking blog, lies of which Toni was made aware, I delayed exposing her faux pas, to give her every opportunity to correct or retract her mistakes (she didn’t). Furthermore, I use proper blogging etiquette and strikethrough if I have to make changes, unlike Toni who completely deletes and rewrites posts on a whim. Essentially Toni is asking why we we would bother to stick up for someone (Keenan Vanginkel) we do not know personally. In my opinion her inability to grasp the why factor is telling. Toni Ingram has made it her life’s mission to ruin the lives of others based on faulty logic and substandard science. There is absolutely no evidence that Keenan stalked or murdered Morgan, but that doesn’t matter to Toni. She slanders and accuses any and all who dare to disagree with her, unfettered by morals or conscience. The young people Toni bullies have barely crossed into adulthood. Life is hard; Competition for opportunities to advance is greater than it ever was. Toni Ingram is robbing these kids of their futures and limiting their opportunities by besmirching their names.